Regular exams and cleanings are the best way to maintain a healthy smile and address possible problems before they progress. Here are some services we offer that help you establish good oral health habits for the future. All porcelain crowns and veneers. Single tooth whitening for darkened teeth that are root canal treated. Minor tooth movement to achieve better arch form. Occasionally, teeth need to be removed that are unsavable or that do not have enough room to erupt normally. 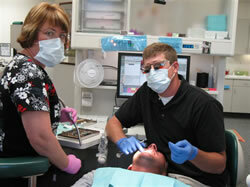 We are set up to perform many extractions in-office but also have a network of oral surgeons available for referral. Dental implants are a great way to replace missing teeth or add stability to dentures. We now have the capability to place some implants in-office. Implants for single or mulitple teeth, or in conjuction with a removable denture. The Invisalign system is the virtually invisible way to straighten your teeth and achieve the smile you’ve always dreamed of. Using advanced 3-D computer-imaging technology, Invisalign depicts your complete treatment plan, from the initial position of your teeth to the final desired position. Then a series of clear aligners are custom-made for your teeth to move them little by little. Each aligner is worn for about two weeks before being replaced by the next in the series, until the final position of your teeth is achieved. Our practice offers state-of-the-art digital imaging, providing the patient with less exposure to radiation as well as instant images.